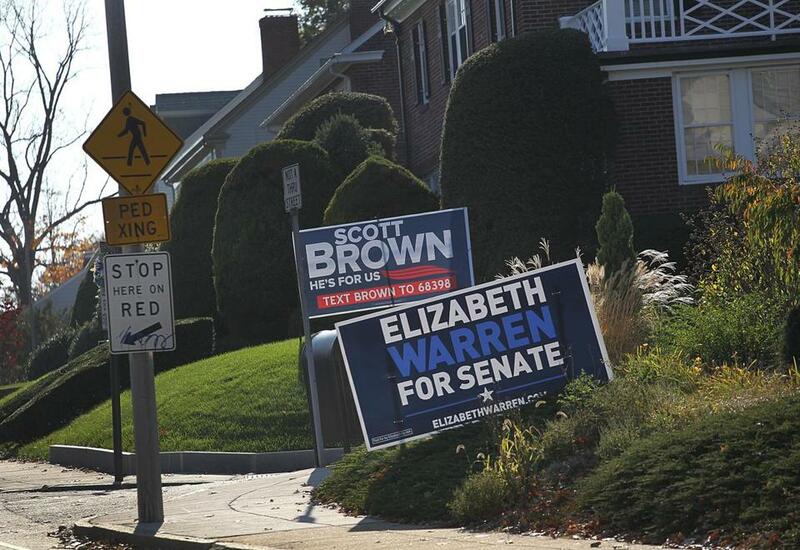 Campaign signs claim equal attention on the same corner on Centre Street in Jamaica Plain. By both neighbors’ accounts, the keeping-up-with-the-Joneses competition began on Howard Lehr’s yard in Jamaica Plain. Lehr, an independent voter, put up a small campaign sign to show his support for Democratic Senate candidate Elizabeth Warren. Then, his neighbor, Marc Rosenfeld, an independent, tried to show his love for Warren’s rival, Republican US Senator Scott Brown. He said his small sign looked “puny” on his prominent yard, though, so he asked the Brown campaign for another. The campaign obliged and gave him a 4-by-8-foot “billboard” to advertise his support to the tens of thousands of motorists who travel daily from the Arborway Rotary in Jamaica Plain. Not to be outdone, the Warren campaign gave Lehr his own billboard. The neighbors’ yards boasted massive, dueling signs advertising their differences in the divisive 2012 campaign. But the families who differ so vividly on the election are united on this point: They still like one another very much. The Globe caught up with three people featured in an earlier story about undecided New Hampshire voters. Read who they voted for. “They are lovely people,” Lehr’s girlfriend, Colleen McKenney said, returning the compliment. Campaign signs, of course, suffered this season not only from the traditional vandals but from Hurricane Sandy. Some homeowners took down their signs temporarily to prevent them from becoming flying objects. Lehr’s sign was damaged, presumably by vandals, and he could only get a series of smaller ones from the ­Warren campaign, thus handing his neighbor the ­visual advantage yet again. In an era when Congress is paralyzed by partisan rancor, and nastiness has dominated political discourse, it seems quaint to expect neighbors of conflicting ideologies to coexist happily, maybe even neutrally. Yet across the region, many people who live on either side of the hedges and opposite ends of the political spectrum live in domestic harmony while advertising their differing views. Sometimes Lehr comes over for a cocktail. Sometimes, Lehr helps with a household task that Rosenfeld, who has a ­degenerative neurological disease, cannot handle. They’re not just neighbors. “I would say we’re friends,” said Rosenfeld, who used to own Rosenfeld’s Bagels in Newton. Lehr, an electrical worker who started in the union and became the head of Suffolk Electrical Co., learned early not to talk politics with people close to him. 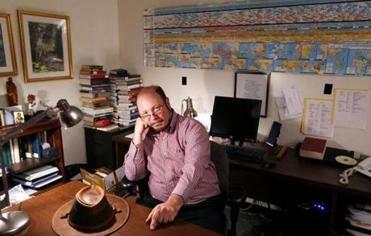 His mother was once a big Republican activist, he said, and his own children both ­became strong Republicans. He, instead, joined the third march for civil rights in Selma, Ala. He kept his mouth shut. Similar odd couples coexist, even in liberal enclaves like Cambridge. On William Street in Central Square, Warren’s blue signs adorned the windows and lawns of three houses, while just a few paces away, two homes were marked as GOP turf, with signs promoting Republican nominee Mitt ­Romney for president. “It does a better job than ‘Keep off the grass,’ ” joked home­owner Cosmo Cremaldi. Cremaldi, who used to align with Democrats, has been peacefully coexisting here for decades. He and his wife, ­Catherine, owned Cremaldi’s specialty foods shop in ­Cambridge for years and had to get along with their customers, as well as neighbors. Now ­retired, they feel a little freer to speak their minds. Their window is decorated with “Don’t Tread on Me” and “National Rifle Association” stickers. He keeps copies of American Rifleman magazine on the kitchen counter. They brag that they recently attended the same dinner as conservative Supreme Court Justice ­Antonin Scalia. But on Saturday mornings, they invite their neighbors in for coffee, and their political ­debates turn to good-natured ribbing, rather than disputes. Their daughter, Genevieve, is a cooking blogger and stay-at-home mother. She and her husband have 5- and 7-year-old daughters, a golden retriever named Daisy, and a yard full of chickens. She also had a ­Romney sign in her yard, next door to her parents’ house. Since she and her husband renovated the house, she said, Cantabrigians would keep walking by, seemingly eager to appraise the changes. Then they noticed the Romney sign. And they hesitate. “I try to kill them with kindness,” she joked. A conservative through and through, Genevieve Cremaldi trades barbs with a friend and neighbor who had an Obama sign on her house.